- Selenium, when originally created by Jason Huggins, solved the issue of getting the browser to do user interactions. - The Selenium API was focused on running tests written in HTML using a three column design (similar to FIT). Selenium IDE is a good example: the three input boxes (command, target, value) match to this framework. - Patrick Lightbody and Paul Hammant created Selenium Remote Control (RC) using Java as a web server that would proxy traffic. 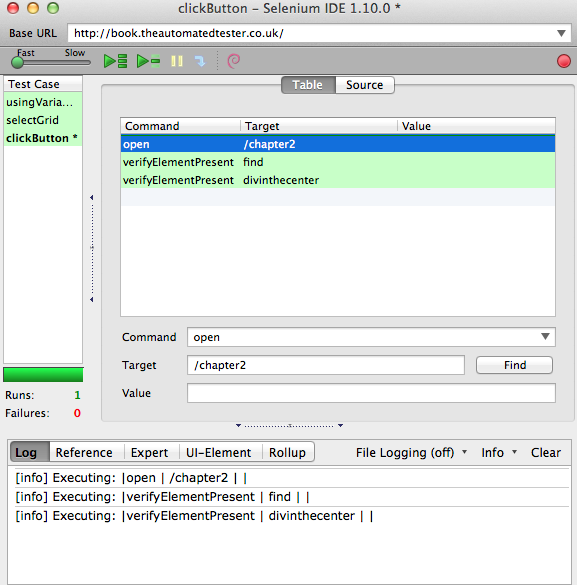 It was designed to utilize the same three column approach as the IDE. Different languages and bindings were allowed to be used, provided they adhered to the three column "Selenese" format. - There is now somewhere around 140 methods available for the Selenium API. Lots of choices, figuring out which one to use? Hmmm, getting to be a challenge. - Selenium RC was starting to struggle with the development of HTML5 and Mobile devices. A different approach was going to be needed to handle these changes. Everyone is going to do this slightly differently depending on the platform that they have. If you are using Darwin, it's pretty straightforward. 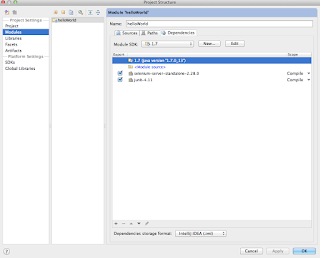 Download Intellij IDEA and drag the Application over to the Applications folder. Note: for this purpose you will want to either download the Community Edition, or the 30 day trial of the Ultimate Edition. To keep things simple, I'd suggest the Community version and, if you decide that IDEA is just all that, then you could upgrade and shell out the $199 for the Ultimate version. Your call. Everything I'll be doing will be with the Community version. Also, the version being referenced in the book is version 11. I'm using build 11.1.5 for the examples. If you want to follow along with the book, I'd suggest getting the same version. Version 12 is the latest, but things are in different places. If you are not familiar with the IDE, and don't want to do a continuous mental conversion, I think it's best to follow along with something that matches the rest of the book. Next step is to actually create a project and link up everything you will need. First, Apple ships with a version of Java, but if you want to update it to the latest version, go and get the JavaSE SDK for MacOS (the current version as of today is http://download.oracle.com/otn-pub/java/jdk/7u13-b20/jdk-7u13-macosx-x64.dmg ). Once you have installed or located the version of Java SDK that you will be using. you need to link it to Intellij IDEA. This is done at the project level. In Platform settings, you can choose the SDK. For me, that's at /Library/Java/JavaVirtualMachines/jdk1.7.0_13.jdk. Yours may be in a different place, the point is, load that file, and the system will populate a number of tabs (Classpath, Sourcepath, Annotations, and Documentation Path). - get the project you want to work with set up, and view the project in the project pane. - ctrl-click on the name of the project and select "New: Directory"
- call this directory "test"
- click on "File: Project Structure" [or if you want to be a keyboard ninja, use "[command]-;"
- click on "Modules" and select the "Sources" tab under the project name. Here you will see your source folder and on the right, the file tree with your new "test" directory. - highlight the "test" folder with the mouse, then click "Test Sources". If the test folder turns green, you're good. - to the left, click on "Global Libraries". Click the "+" button in the middle column and go and link to selenium server and junit (if you don't have junit yet, download it from http://cloud.github.com/downloads/KentBeck/junit/junit-4.11.jar). 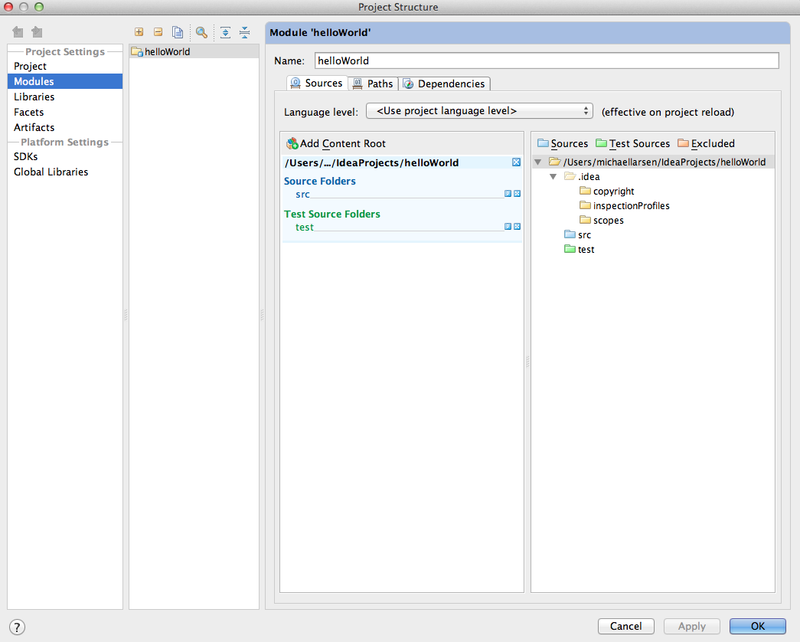 - create Global library entries for both Selenium Server and for junit. - go back to Modules and click on the "Dependencies" tab. Select both selenium server and junit jars to associate them with this project. Note: my environment differs from what the book is looking for, in that it calls for a selenium.jar and a common.jar, which would be in the same place as the selenium-server.jar. My problem with this is that I have downloaded both 2.28 and 2.29 zip files for selenium server, and neither of these mentioned jars are part of those distributions. There are a variety of commons jars in the lib for the server distribution, but none by these names. It's possible that this is a standard option for those who build the source for Linux, and again, if so, this is a piece of implicit knowledge that is not included with the book. Again, I'm running Darwin, and without doing a dig for other sources, I don't see these jar files, but Google Docs says concerning selenium-server-standalone... "Note that this JAR contains all of the required dependencies". I can confirm that the standalone server starts up, so for now, that's what I'm going with. OK, that wasn't so bad, although I will admit it took me a few times circling around to see if this would work. I understand why David wanted to use an IDE for this, in that, while it's a lot of moving parts to keep track of and get working together, going forward, it makes it simplet to write the examples, since we all understand that anything going forward is specifically taking place in this IDE, with this setup, and with these dependencies. It's entirely possible I may find that what I have is inadequate and I may have to do something different to make this work later on, but I'll jump off that bridge when I get to it. 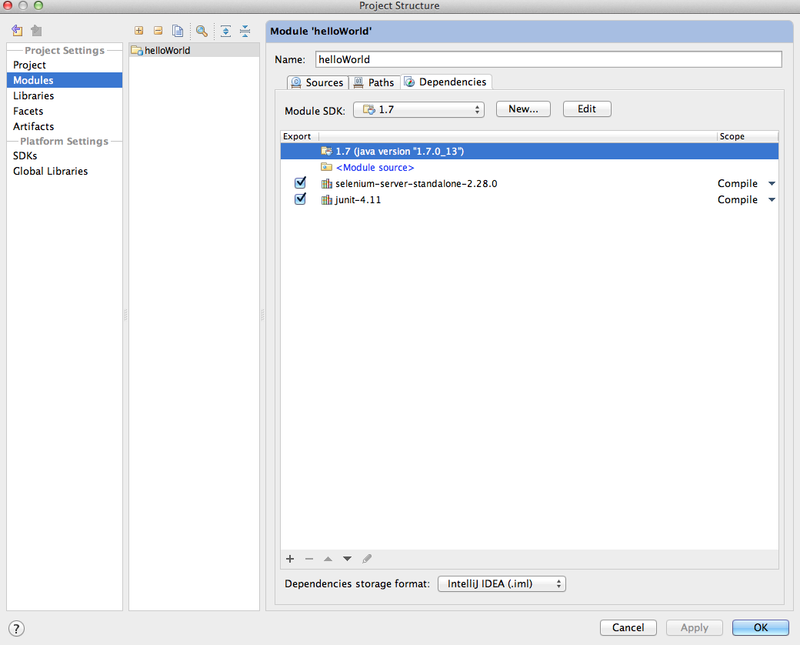 For now, if you have done what I have done, you now have IntelliJ IDEA 11.1.5 that links to JDK 1.7, junit 4.11 and selenium server standalone 2.28 (you can of course use whatever versions you want to :) ). And that about does it for this chapter. Next time, we'll be looking at design patterns for Selenium WebDriver and how they can, hopefully, make test creation, and our lives, a little easier. Sumit, the answer for this particular project is, since David wrote the book and used Java as the examples, I chose to likewise work through the book and use Java for the examples, so I could see where the book lined up with real world use and if the examples worked as advertised. The answer is, a lot of the time, yes, but sometimes, the code displayed in the book is not accurate; there's a number of errata listed, I'm planning to share a few more with them in the coming days. As to which language to learn, I think it's important to use the same language (where practical) that the development team is using. I've used Selenium in environments with Ruby, with Java and also with Perl, so it really comes down to what the team needs, and what you feel comfortable working in. I may try something later on where I look to see if I can convert the examples in this book and in the Cookbook from Java to Ruby or Perl, but that will come much later :).